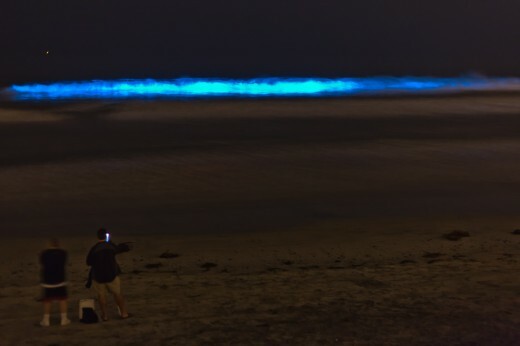 Southern California Beaches Present: The Bioluminescent Red Tide! Here in San Diego, Ca., we are often reminded that the most spectacular and awe-inspiring entertainment comes from Mother Earth herself. For a limited time – doing her best Vegas impression on Southern California beaches from Point Loma to Huntington Beach – the luminous, the electric, the dazzling… Lingulodinium polyedrum! During the day we simply call her “The Red Tide” however, by either moniker she is a show-stopping happening not to be missed. Every so often these tiny, miniscule algae “bloom” by the billions, giving the ocean a red sheen by day – hence the name “red tide”. At night, the bioluminescent magic show (technically science show, however I’m sticking with the Vegas metaphor) begins as each cell gives off a flash of neon-blue light when jostled about. This means every wave, every outline of a fish, and every footstep on the sand glows like an unbelievable scene from ‘Avatar.’ A red tide is, literally, phenomenal. Red Tide Bioluminescence. Photo courtesy of Kevin Baird. Please email marketing@sdcvb.org if you have taken any pictures or video and would like us to post them! This entry was posted in Family Vacations, Insider Tips, Outdoor Adventures, Tours & Sightseeing and tagged beach, beaches, Carlsbad, la jolla, nights, Point Loma, solana beach, surfing by Maren. Bookmark the permalink. Beautiful, when will the next red tide happen and how often? I want to make plans ahead to see it personally. Thank you.